Home > THE HOLIDAY SHOP at OOAK Just For You! Personalized to make the perfect Hostess GIft available in red or white. Any host/hostess would be honored to receive. Personalized with the name of your hostess on the chef's hat. Personalized pencil tin, definitely used for more than just pencils. This metal tin is approx. 7" x 3 1/2" x 1 1/2". Contact OOak to discuss personalization ideas or send your ideas to OOak - Just For You! Note: Additonal fees may apply to create artwork. $4.00 shipping at checkout This couples ornaments, celebrates the union of a lovely couple. It showcases their wedding date, with both his and her names. It's embellished with a silver plated LOVE coin and a silver ribbon. Approx 2 1/2" round. Ribbon color may vary. $5.00 shipping at check-out. This item will ship separately. Ethnic Holiday Mugs, created just for you. Four to choose from. 15 oz white ceramic mug comes in a nicely packaged white gift box. $6.50 shipping This unique family tree, showcased the name of those that you love most in life. Etched glass block, approx 4" x 6". Stand alone. Add the names of up to 20 family members. Names will be arranged, per OOak's discretion. $6.50 shipping at check-out. Family Tree Tile, approx 8" x 8". This gloss finished tile is personalized "Just For You." Comes with natural wood stand for display. This is the PERFECT gift for new parents to celebrate their new baby's first Christmas. Add a name, birthday and a set of footprints in either pink or blue. Approx 2 1/2" round. Frosted or clear. Ribbon styles may vary. $5.00 shipping at check-out. This item will ship separately. This red, white and blue frosted ornament is a beautiful way to celebrate your favorite soldier. The caption reads, "All I Want For Christmas is (enter your soldier's name) Home Safely." Add his / her name to the back. Great gift idea to honor a service member. 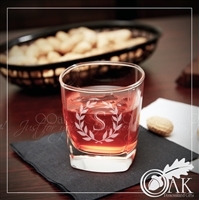 Monogrammed "mini" rock glasses, set of four. Etched with your initial inside of a floral wreath. 6 oz glass.